* Includes Sticky Tickets booking fee. ** Ticket prices may vary slightly based on the payment method selected at checkout. Hi-ho Mouseketeers! 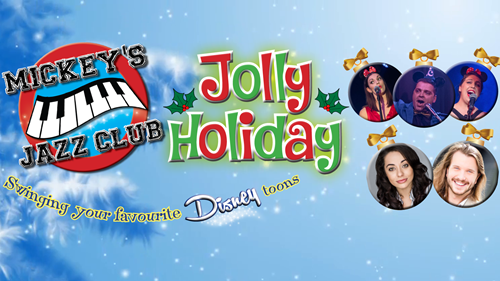 Mickey's Jazz Club is swinging your favourite Disney toons one last time for 2018, in our Jolly Holiday special! Featuring new festive versions of Disney classics; and the best of MJC 2018. Mickey's Jazz Club are the ultimate nostalgia band, the Postmodern Jukebox of Disney. Your inner child has never looked so classy. Every Mickey's show is packed with brand new never-before-heard jazzy arrangements of Disney songs (plus some crowd favourites); gags and fun facts about the movies. So you'll never see the same show twice! Dress code this show is Festive Disney and you might even win a prize! It's an All Ages gig, and The Newsagency is now a licensed venue! As always your Mouster of Ceremonies is the highly animated Jonathon Holmes, and donning the guest-ears are Monique Salle (Mamma Mia) and Nicholas Gentile (Broadway Reimagined).